Plant Biosecurity University focuses on providing high quality online training for invasive plant pests in the agricultural, urban, and natural area environment. 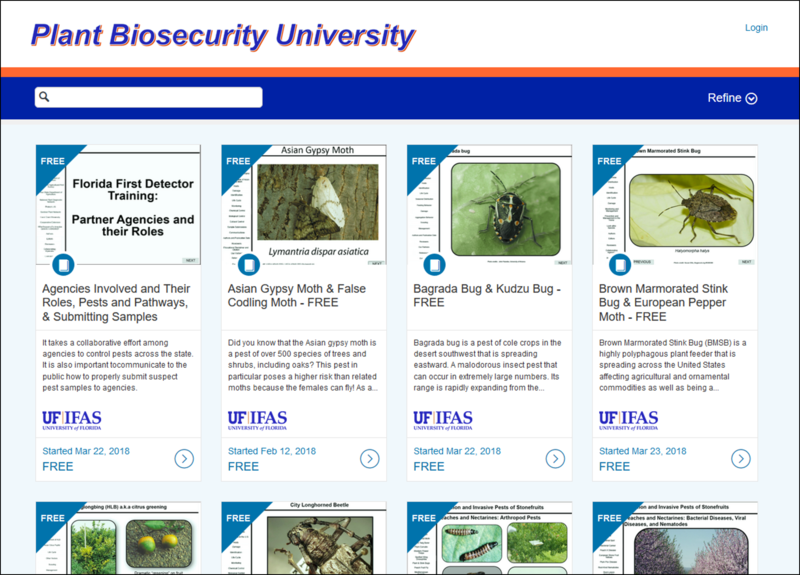 Online training may include invasive pests that have recently arrived in Florida, are not known to occur in Florida, or are not known to occur in the continental U.S. In some cases, common pest identification may be the focus of training opportunities as it is difficult if not impossible to identify potentially invasive pests if you are not familiar with the common ones. These modules are based on the scripted presentations but have interactive features such as roll overs, choose the correct image, and learn more buttons. Click here to browse the available modules we offer in the IFAS Plant Biosecurity University catalog. Click on the module to enroll with your name and email address.